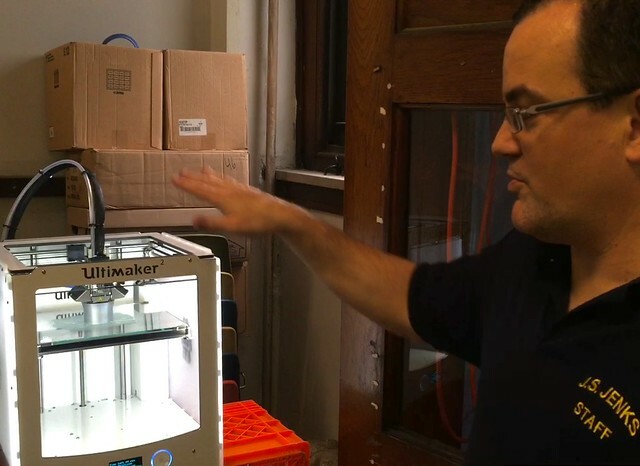 A generous school parent purchased a 3D printer for James Hilburt's math classes at the J. S. Jenks Middle School in the Chestnut Hill neighborhood of Philadelphia and Hilburt is getting the students excited about designing their own projects by printing out 3-d stackable cups, a rubik's cube-like 3d puzzle, a complete chess set and small replicas of the Disney Castle and the Eiffel Tower. To help the students understand design and construction, Hilburt is first having them build a bridge with Popsicle sticks. For the 3d printer projects, Hilburt downloads digital templates onto his computer and loads them into the printer; a rapidly moving arm lays down layer after layer of threadlike strands of melted plastic through a small nozzle head to build the creations from the ground up, taking nearly a day for the more complicated ones. Watch video here.